Presque Isle Light Station is a complex of three historic buildings including a lighthouse tower and two keeper's residences. 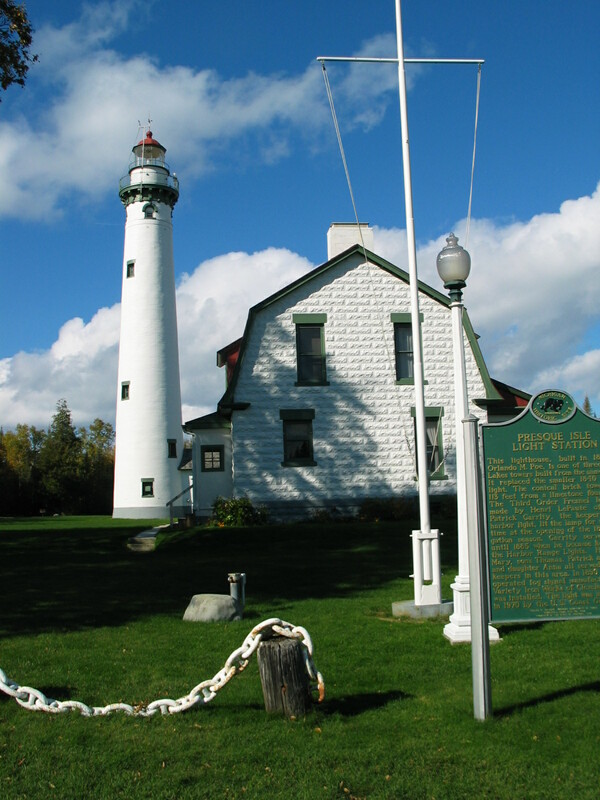 Located on the Lake Huron shoreline near Presque Isle Harbor, the "New Presque Isle Light" is the tallest lighthouse tower accessible by the public on the Great Lakes. Built in 1870, it replaced the 1840 harbor light. The light station complex is part of a 99-acre township park that includes a playground, picnic area, pavilion and nature trails. A gift shop is located in the original keeper's quarters connected to the tower. Visitors, for a nominal fee, may climb the 130 steps to the top of the tower for a spectacular view. An unattached 1905 keeper's dwelling has been painstakingly restored. It is now a museum that provides visitors with an opportunity to learn about local history, as well as how keepers and their families lived.